Why Intel chose to release these 2 SKUs secretly, your guess is as good as mine. However there are a few things about this secret “flagship” processor that might have been the reason Intel decided against putting it in the limelight. Well before I go into that let me tell you the details of the SKUs first. The E7-8895 v2 was launched just this week. As you can probably see from its nomenclature that it is a direct successor of the E7-8893 v2 launched just a few days ago as well. You may recall that the Xeon E7 v2 family is part of the Intel Ivybridge-EX series of Ivytown processors. Preceded by Westmere-EX and designed for ‘BiG Data’ crunching. 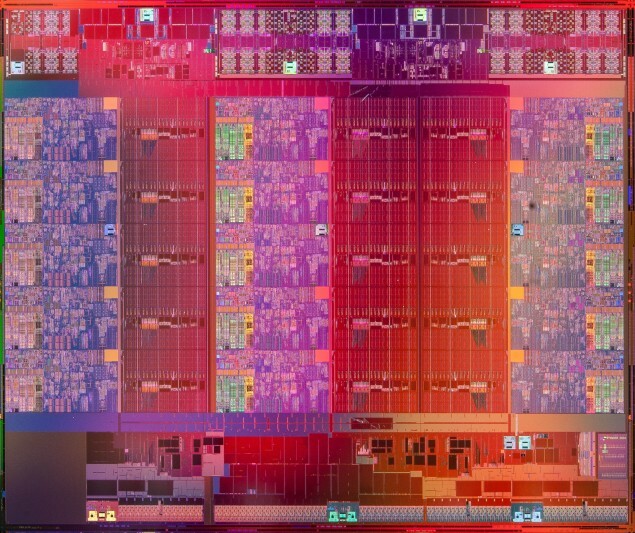 The chips features an insane 4.31 billion transistors and a massive die size of 541mm2 with a modular architecture which splits the cores into blocks of three, each block has five cores with their own L3 cache, embedded ring bus and I/O. This modular architecture scales from top to bottom of the Xeon E7 lineup with Intel shifting and removing the columns to offer cost effective SKUs. Now the E7-8895 v2 basically has an increased turbo speed of 200 Mhz. However, it also has a lower thermal operating limit than the E7-8893 v2 which would mean that you would need to give it better cooling for the 200Mhz increase. This is the reason i was referring to earlier. Apart from that, the specs are an exact replica of the previously released Ivybridge-EX series high end SKUs. Now the other SKU released is the E3-1284L v3 and is a very low wattage processor with TDP of only 47 Watt. More importantly it is the only processor in the E3-1200 v3 family to feature an Iris Pro iGPU solution. To see how Iris Pro fares in benchmarks go here. However the downside is that this is BGA packaged chip and cant be used with 1150 sockets.